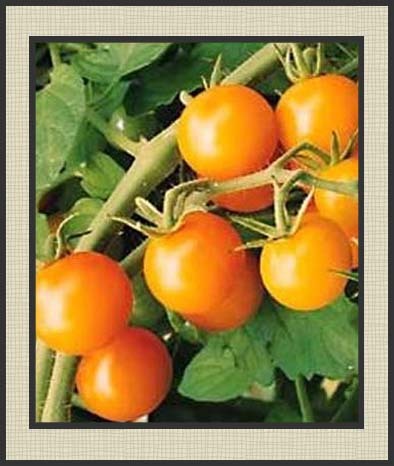 This plant produces heavy yields of golden yellow cherry tomatoes. They are very sweet and grow in clusters. While it is a crack resistant variety it does have a tendency to split. However, if you pick them early enough, after they turn yellow before they get golden they will ripen in a day or two and you won’t have fruit with split skin. It is said to be a mid season tomato, but last year (2011) these were making ripe tomatoes first…even before my “Early Girls”. This cultivar would grow well in a container.